Winter tourism is a significant part of the economy of Alpine countries and the most important source of income in many regions. In Austria, winter tourism revenue makes up 4.5 per cent of GNP and half of the total income from tourism. Much of winter tourism is based around the ski industry, which is dependent on reliable snow conditions. Although snow fall is expected to increase at high elevations, it is winter temperatures that largely determine the depth of snow that accumulates on the mountains. 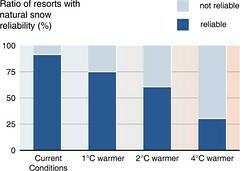 The Alps are currently warming at roughly three times the global average. Climate models project an increase in winter temperatures of about 1° to 3° C from 1990 conditions by 2050, with greater warming at higher elevations. An analysis of snow cover in the Alps concluded that each increase of 1° C corresponds to a 150 m move up the mountain of the line marking the lower limit of adequate snow for ski resorts. This means that each degree of warming will result in a further decline of snow conditions to the point that more and more current ski operations will not be viable. The figure presents the results of an analysis of 666 medium to large ski areas in France, Austria, Switzerland, Italy and Germany. Natural snow-reliability means on average a season of 100 days with at least 30 cm of snow on upper ski run.